STUDENTS CLICK HERE TO EMAIL US FOR ORDERING INSTRUCTIONS. “CCLD” (revised January 2018) is the substantive companion to LBTN. Scroll down for a more complete description. 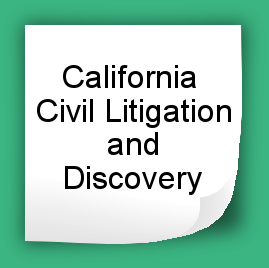 California Civil Litigation and Discovery (“CCLD”) is a 218-page coil bound book which takes a substantive approach to litigation, e.g., what the pleadings should say (naming parties, jurisdiction, stating elements of causes of action), rather than what they look like and how they are filed and served; discovery strategies and drafting hints (scope of discovery, discovery plans, drafting written discovery, objections, and responses) rather than format, limits, and deadlines, etc. Updated as needed (when C.C.P. changes). View the Table of Contents and Excerpts below.